Tanasi (pronounced tah-nah’-see) is the origin of the word Tennessee. The Tanasi Arts and Heritage Center was created to showcase Tennessee mountain arts, crafts, music, drama, dance, literature, history and heritage, food, and natural beauty. The Center is being developed in two phases. The planned Center facility is pictured above. 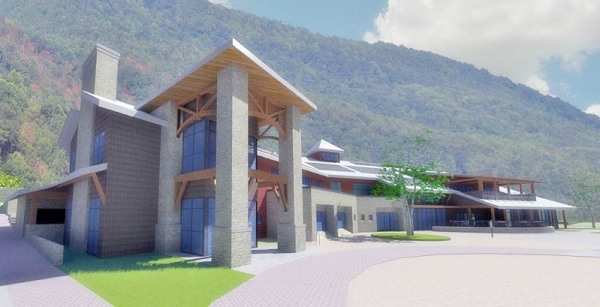 The building will have an interpretative area telling the story of the mountain arts. Guest studios will provide regional artists and craftspeople with a space for working and displaying their creations. Special exhibits will depict the customs and life of the Tennessee Mountains. High-quality juried fine arts and crafts will be featured and available for purchase in the facility’s gift shop, and both outdoor and indoor performance venues will offer music and dance performances. The facility will also include a restaurant that serves delicious locally grown foods prepared in the traditional Tennessee mountain style. Fully-equipped modern conference facilities will provide comfortable meeting spaces for rental by groups large and small. The temporary home of the Tanasi Center is within sight of the Center’s future facility. It is housed within the Town of Unicoi’s newly developed Unicoi Tourism& Information Center. There, a Tanasi Gallery displays regional arts and crafts for sale. Periodic demonstrations such as painting, pottery, wood carving, weaving, and broom-making will be held on the grounds of the Tourism & Information Center. Click here for more information.